In recent years the Italian shipyard operator, Fincantieri, has undertaken a number of highly complex conversion and upgrade projects involving passenger ships. Several of these projects, including the MSC Cruises quartet, MSC Armonia, Lirica, Sinfonia and Opera, have required the significant lengthening of the vessels, with the insertion of pre-fabricated mid-body sections. The company continued to capitalise on its experience in this field when, earlier this year, the Italian owner Grimaldi signed a contract with Fincantieri to carry out the lengthening and extensive refurbishment of its ferries, Cruise Roma and Cruise Barcelona, which were built by the Italian yard in 2007 and 2008 respectively. The lengthening of these two ro-pax ships will include additional cabins, new public spaces and restaurants, as well as the creation of an equipment room for the installation of electric batteries. At present, prior to lengthening, the 54,000gt vessels are 225m long, with capacity for 3,000 passengers, and have a 2,400m2 car deck and 3,000 lane metres of space for heavy vehicles. Following the lengthening, the vessels will be rated at 63,000gt and will be 254m long, with space for 3,500 passengers, and will feature a 3,400m2 car deck and 3,600 lane metres. Working closely with the classification society, RINA, Fincantieri has prepared a feasibility study to address the complexities of this project. All the required approvals have now been obtained and the company’s ship repair and conversion division will start work on Cruise Roma at the Palermo yard in January 2019, with work expected to take around 12 weeks to complete. The lengthening of Cruise Barcelona will take place shortly afterwards at the same shipyard. Fincantieri’s vice president, ship repair and conversion, Andrew Toso, says: "The main aim of the project is to increase passenger and vehicle carrying capacity. However, in this case the ferry operator has also implemented a very environmentally friendly approach and will dedicate some of the space created by the new mid-body section to install a bank of mega-lithium batteries. This will allow the vessels to have zero emissions in port, as all of the electrical needs will be met by the batteries, which will then be recharged while the ships are at sea." It is believed that this is the first time that batteries have been installed onboard a ferry during lengthening, making this project particularly notable. The programme of work entrusted to Fincantieri will also include the installation of a scrubber system for exhaust gas cleaning. The lengthening part of the project will involve the construction of two new 28m long mid-body sections which will be inserted into the ferries, creating 20 additional cabins on each ferry. The new mid-body section will also provide more deck space, so that the existing sun deck will be increased in size by about 600m2. Two new seating areas will be added, providing an increase of 500 seats, and a new family-orientated self-service restaurant will be created with seating for about 270, which will also comprise a space for children to play. Fincantieri will additionally create a movable partition in the existing restaurants to provide Grimaldi with the option of using part of the space for a specialty restaurant. In order to reduce the time that the vessels have to remain out of service at the shipyard, the new mid-body section, which contains about 1,700tonnes of steel and another 600tonnes of outfitting materials, is currently being prefabricated and assembled prior to the arrival of the first vessel at the Palermo facility. Toso explains: "The idea is to pre-outfit the new section as much as possible. The aft section – the heaviest part of the vessel – will remain stationary on traditional dock blocks, while the forward section will be laid on special movable blocks, called skid shoes. These skid shoes can be moved forward using hydraulic cylinders in order to create the space for the insertion of the new mid-body section." Separately, the mid-body will be mounted on a specially prepared self-propelled modular transport system. "These multi-wheel systems can move a huge amount in terms of weight and will be able to insert the new section in a very precise way within the gap created in the existing vessel, so that we can then start the welding process," adds Toso. Materials in all of those areas which are in the way of the cutting line will have to be removed to create a clear space around the hot work required to first cut the existing steel structure, and then weld the new section. Around seven to ten days before the arrival of the vessel in the shipyard, Fincantieri will assemble teams onboard to prepare the vessel for cutting. These teams will remove the panels, floors and ceilings, and then mark all of the cables and pipes that have to be cut, so that they can be accurately reconnected after the mid-body section has been inserted. Fincantieri is no stranger to such projects and the Grimaldi vessels will in fact be the sixth and seventh ships lengthened by Fincantieri over the last five years. 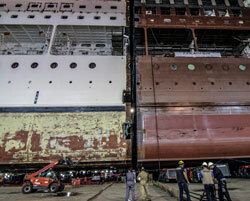 The most recent was the lengthening of the Silversea Cruise ship Silver Spirit, which had a 15m section inserted in the central part of the ship between March and May this year. The company believes that ship lengthening as a means of increasing passenger capacity and internal space will become a growing industry trend. Toso says: "We have received a lot of requests for feasibility studies. The cruise industry is very interested in this option and I hope we get the same feedback from the ferry market."